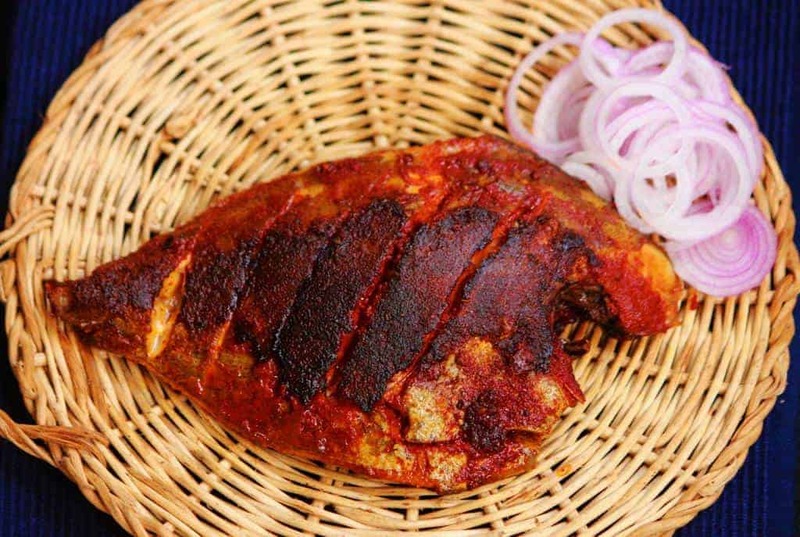 This Mangalorean Fish Fry is packed with flavour from a simple marinade called meet mirsang. Absolutely addictive and so easy! The marinade can be used for chicken, tofu, root vegetables etc., so you should always have a jar ready in the fridge. I moved to Bangalore seven years ago, and that’s when I realized that food down south is much more than idli, dosa and sambhar. Each state in the south has its own distinct cuisine as do states up north. And it’s sad that we are so oblivious to this vast variety of delicious food. I’ve always been a fan of curry leaves and mustard seeds (not used very frequently in North Indian households) and my sister says she always knew I had a South Indian connection. My husband is from Mangalore which is a beautiful, sleepy coastal town in Karnataka. The food there is generously spiced, elaborately prepared and you can always count on a seafood dish to accompany your meal. Over the last two years that I’ve spent visiting my in-laws in Mangalore, I’ve learnt a thing or two. And through the blog, I want to explore some of this beautiful cuisine. One of the first things that I discovered is an all purpose marinade called Meet Mirsang which is a staple in Mangalorean households. This chili based paste is preserved with vinegar and salt, and has an addictive spicy sour zing to it. 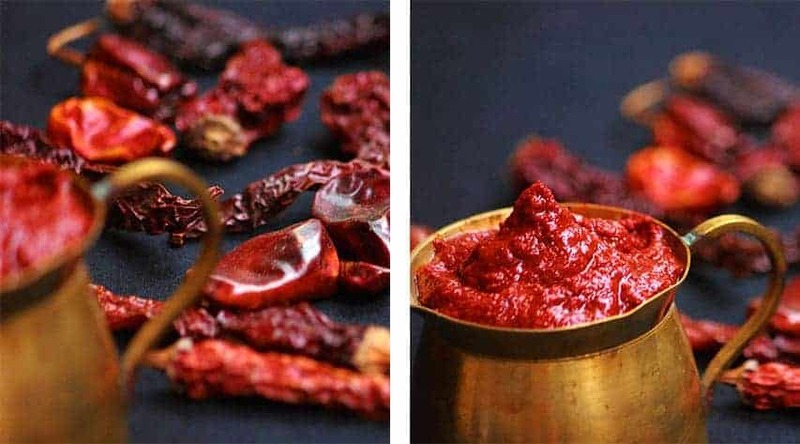 Traditionally this is made by soaking red chilies overnight and then grinding them to a paste on a grinding stone or a mortar and pestle along with other spices and vinegar. The pulverizing movement of a grinding stone releases the flavors and gives the paste a smooth, silky texture which is sometimes hard to achieve in a food processor. I don’t own a large enough mortal and pestle in Bangalore and after a few tries, was able to mimic the taste with powdered red chilies. I would highly recommend going the whole hog, but to begin with, do try this instant version. This is a versatile paste and I will be doing a series of posts to show you how to use this in three delicious ways. Today’s post has a recipe of Meet Mirsang along with an easy Fish Fry which is sure to wow your guests. 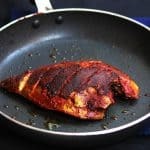 I’ve used Pomfret which is easily available in India, but it can be substituted with any firm fish such as Seer, King Fish or Mackeral. In case you are vegetarian, don’t worry, use this marinade to dress up paneer (cottage cheese), cauliflower and even brinjal. For the Mirsang add all the dry ingredients into a bowl and add vinegar to make a smooth thick paste. Transfer paste to an airtight container and store in the refrigerator for up to 2 months. If using your hands to mix, DO NOT touch your fingers to your eyes or any part of your face and wash your hands thoroughly after use. Make slits in the pomfret and apply one to one and a half teaspoon meet mirsang paste all over it. Feel free to use more marinade if you like it extra hot. Push paste in the slits as well and keep aside for 10 minutes. 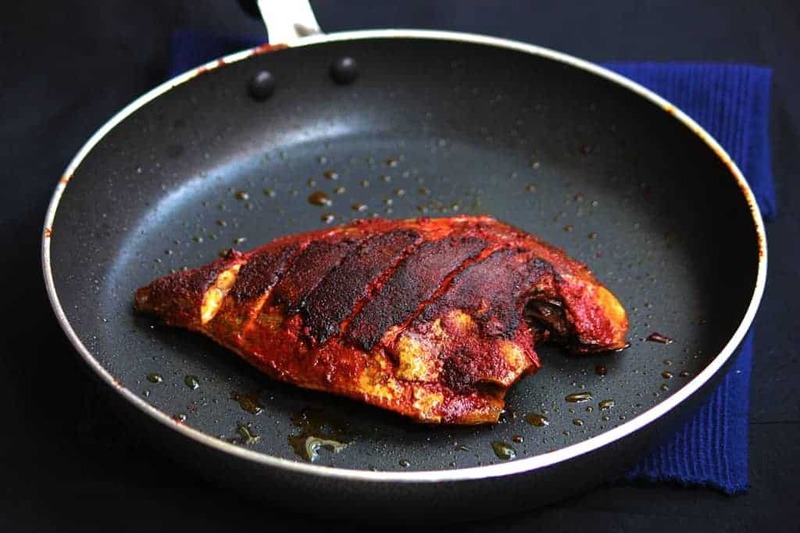 Heat oil or ghee in a non stick pan and slide the fish in. Pan fry the fish with seven minutes on each side. Serve hot with onion rings and a dash of lime juice. Thanks Reeecha…as always you never fail to deliver! That sounds awesome Rekha 🙂 Keep visiting! Ooohhh yum! Sounds awesome. I’m going to give that a try. I tried mixing a litle bit of dry grated coconut in the meet mirsang and stuffing it in to add volume to the stuffing without making the fish too hot. It tasted really good too.